There are certain companies, even certain industries, that consistently float below the radar. Four times a year, we remember them as they announce quarterly and annual earnings and then they fade from our memories. The midstream oil and gas industry is home to many such companies, and today I'll take a closer look at one that's worth remembering. 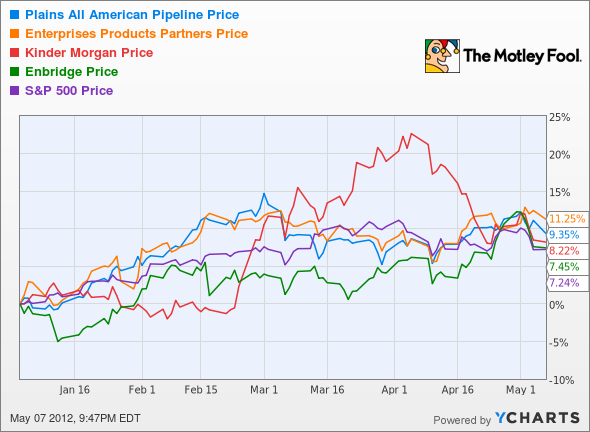 2012 has been a good year for midstream companies, and Plains All American (NYSE: PAA) has taken its seat toward the head of the class. Year to date, the S&P 500 index has returned roughly 7%, but four of the top North American midstream companies -- Plains All American, Enterprise Products Partners (NYSE: EPD) , Kinder Morgan (NYSE: KMI) , and Enbridge (NYSE: ENB) -- have all managed returns better than that. At 9.35%, Plains has one of the best returns in its peer group so far this year. If the company can duplicate its first-quarter performance, expect that number to climb over the course of the year. Revenue climbed across all three of Plains' business segments: transportation, facilities, and supply and logistics. Overall, revenue was up 20% over last year to $9.22 billion, and earnings per share came in at $1.58. Analysts expected earnings of $1.52 per share and revenue of $8.46 billion. Profit was also up from $182 million to $230 million over last year. Plains was chock-full of announcements in April. The company gave up its seemingly annual hostile takeover bid for its rival, Tulsa, Okla.-based SemGroup. The deal was valued at $1 billion and Plains gave no indication of why it was backing down. You always want what you can't have, and perhaps this is not the last we'll hear of this deal. One deal that did go down was Plains' acquisition of BP's Canadian natural gas liquids assets. Plains picked up 2,600 miles of pipeline, special gas-extracting plants, and storage facilities for $1.67 billion in the deal that closed April 1. Indicative of a strong balance sheet, Plains had enough cash to prefund the acquisition and still begin the second quarter with $2.5 billion in liquidity. Finally, one of the reasons that midstream master limited partnerships are so enticing for investors is that they typically offer great yields. During the second week of April the company announced it was increasing its quarterly distribution 7.7% per unit. The move brings its yield up to 5.10% and its annualized payout to $4.18 per unit. Generous dividends create long-term wealth, but Plains All American isn't the only great dividend stock out there. For a look at some other great dividend ideas, check out the Fool's special free report detailing nine rock-solid dividends. Be sure to look over this outstanding report now, it will only be available for a limited time.